The first class Bob Diaco has been able to put together with a full recruiting cycle already included Canadian natives Hergy Mayala, Philippe Okounam and Michael Tarbutt. Now the Huskies secured a commitment from Croatian native Zordan Holman. Also, according to my colleague Sean Patrick Bowley who runs the GameTime CT site, Wilton's Jack Dexter is committed to UConn (as a preferred walk-on). The 6-foot-3, 215-pound Dexter was a tight end/linebacker at Wilton who had 23 catches (seven in a loss to Warde) along with 60 tackles as a senior. He is the third known preferred walk-on from the state of Connecticut joining Naugatuck receiver Bryan Coney and Warde quarterback Brandon Bisack. Alex Mateas, the only UConn player to start every game over the last two seasons, will be suiting up with the Desperados team in tomorrow's College Gridiron Showcase. The game will kick off at 2:30 p.m. in Arlington, Texas. Mateas, who started 29 games at center during his time with the Huskies, is the No. 2 rated player in the CFL pre-draft rankings and he will become the second member of the 2014 UConn team to play in a college all-star game as Geremy Davis played in the NFLPA Collegiate Bowl. Former Central Connecticut State running back Robert Holloman is also a member of the Desperadoes team being coached by former Oklahoma running back Marcus Dupree. UConn's list of commitments just got a little bit smaller. Nolan Ulizio, an offensive tackle out of Lakota West High in West Chester Township, Ohio, posted on his Twitter account that he has committed to Michigan. Once word got out that Michigan extended an offer to Ulizio, it figured to be just a matter of time before he was going to flip from UConn to Michigan. Former UConn football coach Paul Pasqualoni landed on his feet when he was named the defensive line coach with the NFL's Chicago Bears but now he is headed to become the defensive line coach with the Houston Texans according to multiple reports from the Houston media. Pasqualoni earned praise for his work as the Bears line was the one of the bright spots in an otherwise disappointing season. Chicago was tied for last in sacks during the 2013 season, finishing with 31. This season the Bears had 39 sacks, 35 coming from the defensive line and the play of the line improved in other areas as well. However, as usually happens with a coaching change, the previous staff is not retained so when Marc Trestman was fired and John Fox was hired, the changes to the Bears staff began to take place. The Bears have been sending out released in the last few days with the new hires and also with the list of assistant coaches not being retained but Pasqualoni's name was not mentioned leading some to think he may be retained. However, that speculation ended today. Texans hiring Paul Pasqualoni to coach their defensive line. Pasqualoni's new position will allow him to work with perhaps the best defensive player in the game as J.J. Watt is coming off a season where he had 20 1/2 sacks and the Texans had 38 total sacks. Also, the Texans took three defensive linemen in the 2014 draft as defensive end Jadeveon Clowney (since moved to linebacker) went first overall, defensive tackle Louis Nix (who played for current UConn coach Bob Diaco at Notre Dame) was a third-round pick and defensive end Jeoffrey Pagan was selected in the sixth round. UConn a possible landing spot for former Notre Dame safety? Pete Sampson from Irish Illustrated tweeted not too long ago that Eilar Hardy was released from his scholarship at Notre Dame and UConn is among the possible schools he could transfer to. Eilar Hardy has been released from his scholarship at ND and will transfer after graduation. BG, Miami (OH), Purdue, UConn possibilities. Hardy started against Pittsburgh and Brigham Young during the 2013 season, recording eight of his 26 tackles that season in the game against the Cougars. He played in five games in 2014 and finished with nine tackles. With Hardy set to graduate, he will be eligible to play immediately. Hardy was one of the players originally suspended as part of an academic investigation. Hardy was reinstated after being held out of seven games and had eight of his nine tackles against USC in the regular-season finale. Obviously UConn coach Bob Diaco is rather familiar with Hardy as he was the defensive coordinator during Hardy's best season at Notre Dame. The NFL officially announced the 74 underclassmen who have declared for the NFL Draft and five of them would have squared off against UConn in the upcoming season. Leading the list is Missouri defensive end Shane Ray, the SEC's Defensive Player of the Year, who had 14.5 sacks and 22.5 tackles for loss and I've seen some talk that he could be a top 10 pick. Central Florida will lose both defensive back Jacoby Glenn and receiver Breshad Perriman. Glenn had 34 tackles and seven interceptions a season ago while Perriman caught 50 passes for 1,044 yards and nine touchdowns, one coming in UCF's loss to UConn. Tulane defensive back Lorenzo Doss, who had 48 tackles with one of his three interceptions coming against UConn, and Houston receiver Deontay Greenberry (72 catches during '14 season) are also turning pro. UConn will play at Missouri on September 19, will host Houston and play at Central Florida and Tulane during the 2015 season. Speaking of the draft, I noticed that Scott Wright of the www.nfldraftcountdown.com site lists UConn's Byron Jones as the No. 4 cornerback in the draft while Geremy Davis checks in as the No. 26 receiver. UConn has posted its offensive coordinator job (first noticed by Boneyard Blog Beat Writer Matt Schonvisky) meaning the shakeup of the offensive staff continues. A source confirmed that 2014 offensive coordinator Mike Cummings is still on the staff and he will likely move over to coach the offensive line which is something he has done successfully in the past. The Hartford Courant first reported that veteran offensive line coach Mike Foley will not be part of staff moving forward which I was able to confirm. When I spoke with UConn football coach Diaco recently he made it clear that some changes were coming to the offensive staff after a disappointing season on that side of the ball. "I am going to make sure I make the offense looks like I want it to look so there will be changes over there," Diaco said. "I am not trying to double secret agent, I am trying to paint a little bit of a picture for you. There will be changes, I have a very detailed plans and I am working that plan." Although a new person will be in charge of calling plays, I am not expected as drastic of a change in how the offense will look since he brought in Cummings to run an offense built around a power running game and the new OC will be asked to have a similar philosophy. Here's what Diaco had to say about how wanted his offense to look in our recent conversation. "It is no different (than when he was hired)," Diaco said. "It is Stanford, it is Alabama, in terms of what kinds of games you are watching it is a run the ball with authority attack, it is deep vertical drop-back passing, it is plays that protect that run, there are a lot of screens and the rest of the passing game on first and second down is three-step (drops_ otherwise third down is critical so you have to call plays that have those situations (in mind). It is not different to when I stood in front of everyone and that is what we are building towards. At different times during the year, we try to do what our players could do at this point, get a win and minimize some of the issues but never stop building towards that model even if that game didn't necessarily look like that at times, we never stopped building towards that model in recruiting, in the weight room and on the practice field." It didn't take Tom Tabur long to impress his new coach when he took a postgraduate year at Worcester Academy and apparently he caught the eyes of the UConn staff almost as quickly as he is among the growing list of preferred walk-ons heading to UConn in the fall. Worcester Academy coach Tony Johnson said the 6-foot-3, 295-pound Tabur is one of the strongest players he has coached and the biggest thing was to get him to shed some weight to get quicker. "He's become a lot quicker and he did a great job for us," Johnson said. "He's at about 295 pounds and I don't see him taking much more weight off." Tabur, who also has a 3.7 grade-point average, was up at UConn over the weekend and it all felt right for him according to Johnson. The bigger recruiting news of the day, however, involves quarterback Carter Stanley who committed to Kansas and that UConn commit Nolan Ulizio was offered by Michigan according to Steve Wilfong, the director of recruiting for 247sports.com. It was 17 years ago that Az-Zahir Hakim was hoping from a call from an NFL team so he could live his dream of playing professional football. Unlike players like Randy Moss and Kevin Dyson, who were locks to get drafted, Hakim had to sit, wait and hope that he heard his name called on draft day after playing at San Diego State. Hakim not only got his opportunity but he won a Super Bowl playing with the St. Louis Rams and had more receiving yards than all the players selected in the '98 draft than Moss and Hines Ward so he has a pretty good idea of what players like former UConn star Geremy Davis is going through. As the receivers coach for the National Team in today's NFLPA Collegiate Bowl, Hakim has gotten to see Davis up close and personal and liked what he saw. "He had a good week on camp," Hakim said in a phone interview on Saturday afternoon. "He catches the ball well, he isn't afraid to go over the middle." Hakim, who caught 316 passes for 4,191 yards in nine NFL seasons, has been working with Davis and the other receivers on getting lower in the stance and being more explosive coming off the line of scrimmage. "I really liked working with him," Hakim said. "He's a good kid, a hard worker, a good teammate." What Hakim doesn't know if how the 6-foot-3, 216-pound Davis will transition from being one of the most productive receivers in UConn football history to becoming a pro prospect. "I don't really know what they are looking for," Hakim said. "It's not really my department. I have just tried to work with these players, help them. He's a good player, a good receiver. When he and the other receivers got here and worked with me and Andre Reed, they were bright eyed and bushy tailed. They want to learn and we wanted to teach them as much as we could." One former UConn receiver who has made it into the NFL is Stratford's Marcus Easley. Easley has become one of the best special teams players in the NFL. People are noticing as Easley was named as the Buffalo Bills' winner of the Ed Block Courage Award after rebounding from a pair of knee injuries and being involved in plenty of charitable endeavors away from the field. UConn announced what it has planned for Feb. 4 when the newest members are added to the UConn football family. UConn football season ticket holders and donors are invited to attend Coach Diaco’s National Signing Day press conference, which will be held in the Burton Family Football Complex/Mark R. Shenkman Training Center in Storrs at 4 p.m. Those wishing to attend, should RSVP to the UConn Athletic Marketing Office at 860-486-6949 or email to marketing@uconn.edu. As has been the case in recent years, UConn will post updates on Twitter as the letters start rolling. They have added an hourly video update including interviews from UConn coach Bob Diaco and his assistant coaches. Season-ticket holders can submit questions via email or Twitter than could be answered during these video segments. The signing day press conference will air live beginning at 4 p.m. on www.uconnhuskies.com and the football signing day will be shown on the big screen in Gampel Pavilion starting at 5:45 p.m. for those fans in attendance for the men's basketball game. Today happens to be the first day that the UConn coaches can return to the road trying to add to the list of commitments as well as keeping the players already committed. Here is the breakdown of the 22 players currently committed to UConn. It should be noted that quarterback Tyler Davis will start classes on Tuesday when the spring semester commences and his letter of intent has already been signed and delivered. Kirk Livingstone, DE, Stranahan (Fla.): Had 14 sacks in just eight games as a senior and had a game as a junior with seven pancake blocks. Kevin Murphy, OL/DL, West Chester (Pa.) East: Two-way starting lineman earned second-team All Ches-Mont honors as an offensive lineman although he projects to be a defensive lineman with the Huskies. Had 23 tackles for loss and 4 sacks and 32 pancake blocks. Marshe Terry, WR, DB, Northern Burlington (N.J.): 4 of his 11 catches went for TDs. Had interception and fumble recovery in 12-6 loss to Pemberton in Commander's Cup game. Former UConn center Alex Mateas will be playing in the College Gridiron Showcase at Maverick Stadium in Arlington, Texas on Jan. 31. Mateas started 29 games over three years for the Huskies at center, including all 12 games in each of the last two seasons. He is also the No. 2 rated prospect in the upcoming CFL Draft. Considering how many UConn players got to take part in all-star games in the last couple of seasons, things have been relatively quiet in that department after the conclusion of the 2014 season. 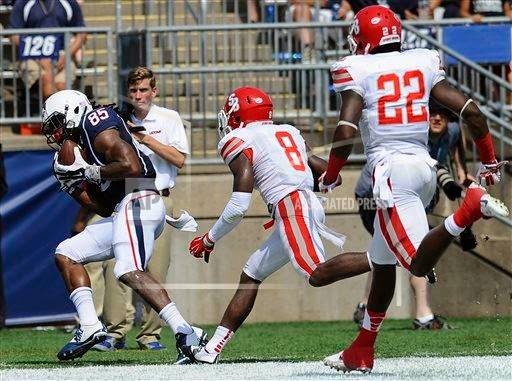 UConn coach Bob Diaco told me last week that receiver Geremy Davis would be playing in the NFLPA Collegiate Bowl. It became official when the NFLPA Collegiate Bowl's Twitter account posted that Davis would be playing in the game which will be played on Saturday at the StubHub Center in Carson, California. The game, which will kickoff at 4 p.m., will air live on ESPN2 while the practices on Wednesday and Thursday will be shown on ESPNU. Davis led UConn with 44 catches for 521 yards despite missing two games and being less than 100 percent in at least a couple of others. Coming into the season it looked like UConn's quarterback position was set for the next few years with the return of sophomores Casey Cochran and Tim Boyle, Bryant Shirreffs transferring in from North Carolina State and a commitment from Tyler Davis. However, a concussion suffered in the 2014 season opener to Brigham Young ended Casey Cochran's playing career. Suddenly the UConn coaching staff was left to ponder the future of the quarterback position. Even before the season came to an end there were reports of the Huskies pursuing quarterback prospects. UConn took a run at Ryan Agnew out of Southlake (Texas) Carroll before he committed to San Diego State. UConn also showed plenty of interest of Dwyer (Fla.) QB Daniel Parr but he decided to honor his commitment to Florida Atlantic. Now the two names of note are Tyree Jackson and Carter Stanley. The 6-foot-5, 210-pound Jackson, who committed to Buffalo in August, threw for more than 2,000 yards and 22 touchdowns while running for another 10 scores, is set to meet with UConn coaches on Thursday before leaving the next day for an official visit to Buffalo according to the Muskegon Chronicle. There have been multiple reports of the 6-foot-2, 190-pound Stanley visiting UConn on Jan. 20. Stanley is coming off a senior season where he threw for 3,070 yards with 40 touchdowns with just seven interceptions while running 579 yards and seven scores. Pro Football Focus released its All-Pro teams and former UConn stars Anthony Sherman of the Kansas City Chiefs and Marcus Easley of the Buffalo Bills made the cut. Sherman is the top-rated fullback by PFF, which rates every play during the NFL season while Easley is No. 1 among punt coverage players. UConn's Diaco: "We expect a much higher level of everything"
In a perfect world, Bob Diaco's first season at the helm of the UConn program would have included a few more wins while the young players got an introduction to the world of collegiate football. The first part of his wish list did not come true as the Huskies limped their way to a 2-10 finish with some rather forgettable performances. But Diaco has no regrets is holding true to his plan. When I spoke to him yesterday, he rattled off the snap counts of players who came into the program either last year or the season before and how their on-field experience a season ago sped up the learning curve. Diaco said he is going to hold those players to a higher expectation level since they were able to learn on the job more than many freshmen normally do. "We did it by design and moving forward we expect a much higher level of everything, mostly culture where they are more ready, the vernacular and language, expectations set," Diaco said. "We don't have to talk about it every day, We are going to lead by example. They are coaching each other on it. Now when a player doesn't know or has forgotten to go down a path, three players grab him before I do and that is where our program is at right now." For the second year in a row, the senior class will be on the small side. There are just 14 juniors on the final 2014 roster but what the class lacks in quantity it could make up for in quality. Linebacker Marquise Vann is a returning captain while his classmates Andrew Adams, Kenton Adeyemi, Julian Campenni, Max DeLorenzo, Dalton Gifford, Junior Lee, Sean McQuillan, Dominick Manco, Tyler Samra and Graham Stewart could continue to play significant roles next season. Caught up with UConn football coach Bob Diaco this morning on a variety of issues which will be showing up in his blog over the next few days but figured I would start with the most pertinent information. This is a prime period for coaching staff shakeups and I haven't heard much about any members of Diaco's staff being on the move. That will be changing. Diaco said he did not have any specifics at this moment but the offensive coaching staff will not be the same one that was in place during his debut season with the Huskies. Desmond Conner of the Hartford Courant is reporting that offensive line coach Mike Foley won't return. "I don't want to create an article because I don't have any news to report but I am going to make sure I make the offense looks like I want it to look so there will be changes over there," Diaco said. "I am not trying to double secret agent, I am trying to paint a little bit of a picture for you. There will be changes, I have a very detailed plans and I am working that plan." So what does he want the offense to look like? "It is no different (than what he said when he was hired), it is Stanford, it is Alabama, in terms of what kinds of games you are watching it is a run the ball with authority attack, it is deep vertical drop-back passing, it is plays that protect that run, there are a lot of screens ..." Diaco said. "It is not different to when I stood in front of everyone and that is what we are building towards. At different times during the year, we try to do what our players could do at this point, get a win and minimize some of the issues but never stop building towards that model even if that game didn't necessarily look like that at times, we never stopped building towards that model in recruiting, in the weight room and on the practice field." As for changes in the roster, Diaco said his goal is to have every player with remaining eligibility on the roster at the end of the 2014 season on the 2015 squad. "We have a goal of zero attrition, 100 percent success," Diaco said. "We want every single play that is on the roster to continue to participate and expire their eligibility with UConn. We are going to be everything in our power to make sure that happens. At the same time, along with all the other issues which become well documented, it becomes a man power issue. We have 60 available players on scholarship that are available to play. It is less than a I-AA number. We can't afford to have anybody washed out of the program, we need every single player on the team and that is just on a business end. On a personal end, I want everyone to have success, that is why we do what we do, that is why we coach college football to help these young men be men and get degrees. You don't want them to not have success." Quarterback Tyler Davis is the only incoming recruit enrolling in the spring semester but the number of scholarship players will increase on Jan. 20 when some walk-ons are given scholarships by Diaco. Diaco also said that receiver Geremy Davis will be playing in the NFLPA Bowl on Jan. 17. His name has not been released as playing in the game but the roster is being announced little by little. "There is high level interest in Geremy and Byron (Jones) and the other guys are going to go to pro day and try to get some traction," Diaco said. It wasn't too long ago that one of Craig Bruno's prize pupils went to UConn as a walk-on only to become a dynamic playmaker as a senior en route to a spot with the NFL's Buffalo Bills. Perhaps lightning will strike again as Bryan Coney, who has been a star receiver for Bruno in the last two seasons at Naugatuck High, decided to accept a spot as a preferred walk-on at UConn 10 years ago Marcus Easley followed the same route to stardom after playing for Bruno at Bunnell. "Last year, I went to their camp and did well at the camp," said Coney, who had 52 catches for 1,171 yards and 20 touchdowns as a senior at Naugatuck. "They offered me a preferred walk-on spot before my senior year started. They told me they wanted to offer me a full scholarship or preferred walk-on and at the end of the season they offered me a preferred walk-on. I took a little while to decide and then I talked to my family and decided the other day that it is the best decision for me. I called my recruiting coordinator Coach (Josh) Reardon and told them I wanted to commit. I talked to him, Coach (Wayne) Lineburg the receivers coach and made the decision that I want to go to UConn. "I am really excited. I go up for an official visit next weekend and I am really excited because I love it up there, I loved UConn ever since I was a kid in basketball and football so I just feel like it is a great opportunity." Bruno, who also helped develop Mark Harrison into a Division I receiver at Bunnell, didn't want to put additional pressure on Coney by comparing him to one receiver (Easley) in the NFL and another one (Harrison) in the CFL. "He is a player that has a lot of potential, they are both great kids, both hard workers," Bruno said. "It's tough to put those kinds of expectations on him, Marcus is doing very well in the NFL right now but definitely similarities, they are both great players. "He definitely stretches the field. I don't know what they have planned for him but he is big, 6-3 and is a great player." Coney credits Bruno for convincing him he could play at the next level. "Until Coach Bruno came to Naugatuck I never really thought about football," Coney said. "He always had faith in me and he always gave me confidence. he was the one who told me. I could play at the next level. He really gave me the belief that I really could do it. He proved it with Marcus and a bunch of other players. He knows what it takes to be at that level and told me I could so I thought I could do it too." A year ago UConn coach Bob Diaco awarded scholarships to punter Justin Wain, long snapper Dom Manco and defensive back Chris DeBerry due to their attitudes and work ethic. That wasn't lost on Coney when it came time to make his decision. "They really made it a point that there was a chance that I could earn a scholarship," Coney said. "I talked to him (Diaco) a couple of times that once you get there it is not about whether you are on scholarship or not but if you are working hard and you are proving yourself you are going to get a spot and get a chance to play. I think I am going to work hard, I want to work hard, I want to play for UConn so I think it is going to work out well. "It is a real family-orientated staff up there so I went to a lot of home games there, took a lot of visits. Everybody on the staff, all the coaches, all the assistants, Coach Diaco are all heartwarming and very heartfelt (people) and I really loved when I was up there and I felt like it was the best place for me even though I may have to be paying a little bit I just felt like that was a place I wanted to be and people I want to be around." UConn is also expressing interest in Hartford Public offensive lineman Keith Coleman. 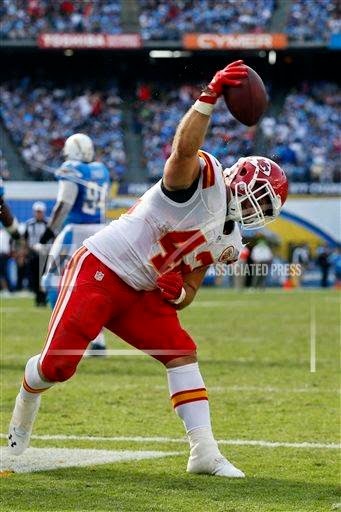 Former UConn star Anthony Sherman was named as the second-team fullback on the Associated Press 2014 All-Pro squad. Green Bay's John Kuhn made the first team with 18 votes. Sherman finished with 14 votes, edging out Marcel Reece of the Oakland Raiders who had 12 votes. Sherman played all 16 games in his second season with the Kansas City Chiefs helping open up holes for Jamaal Charles and Knile Davis. He carried the ball twice for eight yards and had 10 catches for 71 yards including an 11-yard touchdown catch in a win over San Diego on Oct. 19. He was also a standout on special teams and rated as the best blocking fullback in the NFL by the Pro Football Focus site which had Sherman as the starting fullback on its All-Pro team. Despite these two honors, Sherman was named selected to play in the Pro Bowl.